SHORTLISTED FOR THE BAILLIE GIFFORD PRIZE 2017 SHORTLISTED FOR THE LONDON HELLENIC PRIZE 2017 WINNER OF THE PRIX MÉDITERRANÉE 2018 From the award-winning, best-selling writer: a deeply moving tale of a father and son's transformative journey in reading - and reliving - Homer's epic masterpiece. 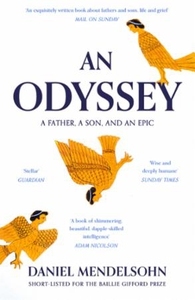 When eighty-one-year-old retired scientist Jay unexpectedly enrols in his estranged classicist son Daniel's course on the Odyssey, the journey of a lifetime commences. Professor and student glean life lessons from the page over a semester and, that summer, son and father take to the sea to follow Odysseus's epic trail. Reading Homer becomes their chance to understand each other before it's too late. Theirs is a moving and erudite story of filial love and the importance of the classics. Rich with literary and emotional insight and weaving themes of deception and recognition, marriage and children, the pleasures of travel and the meaning of home, this is memoir writing at its finest.